PLEASE NOTE: we have moved to new premises. See Contact page for details. 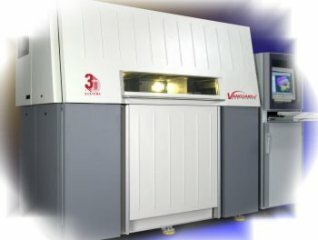 Keyworth Rapid Manufacturing Limited operates a Vanguard HS HiQ SLS (Selective Laser Sintering) Rapid Manufacturing machine. This was originally part of the Rapid Manufacturing facility at the University of Leeds run by the Keyworth Institute and has recently been acquired by Keyworth RML and moved to its current site. The Vanguard HiQ is one of only a few such machines in use in the UK and was originally installed at the University of Leeds in 2002. Supplied by 3D Systems Corporation it is regarded as one of the best all round systems in its class for producing functional thermoplastic models. The machine is supported by a team of specialists in the field of SLS manufacturing with experience gained over thirteen years.